Convertibles have special care requirements for the delicate convertible top material, whether it is made of fabric or vinyl and are not cared for in the same way as your paint. The first thing you must do is determine if your convertible top is a rag top also known as cloth, fabric or canvas or if your convertible top is vinyl. The best way to determine this is to check with your automobile manufacture but keep in mind, if you are not the original owner, the top could have been replaced with a top made from a different material. This could also have been done by the dealership when it was new so it is best to test your top if you are not 100% sure of the material. Determining the type of convertible top is very important as using the wrong product can harm your convertible top. Pour about 1/8 teaspoon of water and put it on your convertible top. Rub the water in to the material. If it soaks in, it is more than likely fabric, if it sits on the top and just smears around and does not soak in, it is more than likely vinyl. Now that you know what your convertible top is made of you need to make sure it is properly cleaned before you apply your fabric or vinyl convertible top protectant. If you don�t, your protection will not be as effective as you have dirt in the way of your protectant. When it comes to cleaning your convertible top, common household cleaning products can be very harmful. Chemicals you should not use on your convertible top include bleach, ammonia, detergent, alcohol and vinegar. Harsh cleaners with bleach and acids will prematurely deteriorate fabric or vinyl. Ammonia and alcohol will dry our fabric and cloud vinyl. Using the wrong cleaners can be a costly mistake which could lead you to the purchase of a replacement top. Use only quality convertible top cleaners for cleaning your convertible top like the highly recommended RAGGTOPP Fabric and Vinyl Convertible Top Cleaner. Your car's soft convertible top is subjected to the same cruel environmental conditions as the rest of your car but your convertible top is not as durable as your painted surfaces. We know how important it is to wax your paint to keep it protected from premature aging. 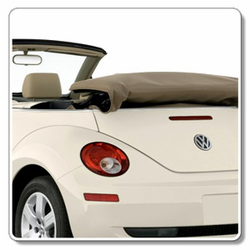 It is just as important, if not more important to protect your fabric or vinyl convertible top material. Although durable, your convertible top is more delicate than the painted steel or fiberglass surfaces. It is crucial to that you protect and keep your convertible top well protected as a part of your maintenance routine. If you leave your convertible top unprotected it will prematurely deteriorate causing your top to not only look bad, it could start leaking! I would recommend THE industry leader in convertible top products, Wolfstein�s, who makes RAGGTOPP Vinyl Convertible Top Protectant and RAGGTOPP Fabric Convertible Top Protectant for your convertible top care. FACT� About 99% of new convertible tops that come on your brand new convertible have stitching along the sides and around glass or plastic window is not treated when it leaves the factory! The material is protected at factory level, but the thread is not. This is what holds your convertible top together so get it protected IMMEDIATELY! Your convertible top�s rear window delicate and needs to be cared for too. Many convertibles have flexible rear windows made of a clear vinyl allowing the window to fold. The rigid and flexible clear vinyl rear windows when not properly cared for will yellow, scratch and deteriorate making visibility a nightmare! Driving when your convertible top is down is a blast, but when it is time to drive with the top up, many convertible owners experience foggy windows. This is especially true for new cars and those who live in warmer climates. The fog is created by the evaporation of plasticizers, which are used in the manufacturing of vinyl to keep it flexible. The plasticizers begin to release through evaporation with the heat of the sun, causing your windows to fog up. To keep your convertible top window clean and clear McKee's 37 Plex-All Cleaner & Polish for All Clear Plastics is a must! It is safe to use as often as you like and will not only clean your convertible top window it will protect it! I hope this article gives you a better understanding of why it is so important to keep your convertible top maintained through proper cleaning and protection. For step-by-step information on cleaning and protecting your convertible top, check out our Autopia University Detailing 101 Series - How To Clean & Protect Your Convertible Top. article. Safely Clean your Fabric or Vinyl Convertible Top! Protect your vinyl convertible top against dust, dirt, and grease!